We started from the top and now we’re here. Rock bottom. The dynastic rot could only be more obvious if Jim Buss played the fiddle while team doctors announced Kobe Bryant’s season-ending rotator cuff injury. The Lakers are 13-37 — even worse than last year’s inferno. Bandwagon fans have bought Blake Griffin jerseys. Diehards line up at emo night and request Randy Newman deep cuts. Sports talk radio sounds like a psychiatric hotline. The good news is that we’ve cycled through the five stages of grief. First, there was Denial: the refusal to believe in Bryant’s deterioration. In spite of his age and brittle tendons, the Lakers brass and fans dreamed that he’d reclaim the franchise’s respectability. It didn’t happen. He shot a career low 37.3 percent, missed every potential game-winning shot, and couldn’t withstand the rigors of an 82-game season. There was Anger. Lakers fans lashed out at Lakers owner and executive VP Jim Buss, former commissioner David Stern (who vetoed the Chris Paul trade), and Paul himself. Ex-coach Mike D’ Antoni was so thoroughly tarred and feathered that you’d have thought he tried to impose a citywide tariff on kale. Bargaining transpired during the off-season. They attempted to lure Carmelo Anthony and LeBron James to no avail. Pau Gasol rebuffed more a lucrative offer from the Lakers for the opportunity to win in Chicago. Cue the depression, compounded with each Carlos Boozer defensive flail. And now here we are: Acceptance. But if you squint your eyes and trust the time-honored Angeleno powers of delusion, it can’t get much worse. The Lakers futility ensures that they’ll most likely retain their Top 5 protected draft pick. Should they snare a top prospect, they’ll have salary cap flexibility and a decent rebuilding core — provided last year’s pick, Julius Randle, fulfills his potential and rookie guard Jordan Clarkson continues to evolve. With the season half-over, the goals are straightforward: trade anyone they can for young talent or draft picks, foster the development of Jordan Clarkson, Ryan Kelly, and Tarik Black, and continue to lose every game, preferably in as entertaining a fashion as possible. In the meantime, it’s time for the mid-season grades for this year’s roster—graded on a curve so one doesn’t re-lapse into the depression stage. Even Kobe's career-low year was immensely captivating. No matter what Kobe you were watching, it was the most compelling part of the Lakers season. Whether he was regaling locker room reporters with wry resignation, inciting unfulfilled fistfights in Temecula, comparing his teammates to Charmin, or hoisting 30-plus shots a game, Bryant stayed immensely captivating. When he figured out that his body couldn’t handle such intense usage, he morphed into a sluggish but brilliant passing point guard—his last elite skill. There were a few triple doubles and a career-high for assists. If nothing else, there was the vintage beauty of his game against the Toronto Raptors. Yes, his exorbitant contract prized sentimentality over basketball decisions. Yes, he shot a career-low and couldn’t play defense. But within 16 months, he’ll be a retired superstar attempting to figure out the floor plan of South Coast Plaza and we’ll still have these final flashes of greatness. And this vine. After 40 games on the bench and a rash of injuries, Byron Scott finally gave the rookie a chance. He’s been impressive, holding his own against elite point guards, displaying stellar athleticism, a nice floater, and a very competitive attitude. He still needs to bulk up to handle the bruising inflicted upon someone with his slashing game. But his length and athleticism could make him the combo guard the Lakers have long been looking for, and one of the late steals in last year’s draft. After spending his early career bouncing around the league, Ellington is a viable candidate to be this year’s Jodie Meeks—a good shooter who gets the chance to shoot a lot and win a nice contract somewhere else. A quality backup who hasn’t accepted the fact that he’s not starter material, Lin lacks the consistency to warrant a return next year. His turnover percentage ranks as the team’s highest among guards at 19.5 percent. He’s shown glimpses of his Linsanity luster, but he’s mostly struggled to mesh with the system and shot only 42.8 percent from the field. He probably won’t be around next year unless he decides to form an improv comedy duo with Swaggy P and gig at the Laugh Factory. About three weeks ago, it seemed certain that Swaggy P would go down as the only athlete in history to get substantially better upon dating a famous celebrity. But then he went from calling himself “IDM” (“I Don’t Miss”) to missing everything. Never an efficient scorer, Young’s shooting has declined from 43.5 percent last year to 36.9 this year (though he’s shooting 90.4 percent from the free throw line, which boosts his true shooting percentage to a decent-enough 52.8 percent). His defensive box plus-minus of 3.6 is easily the worst on the team. He sprained his ankle and pictures surfaced of him with another woman in the car that Azealia purchased him. For the second half of the season, he needs Rae Sremmurd as a personal shooting coach. A career back up forced into an occasional starting role, it’s hard to hate on Ronnie Price. He’s 31, nearing the end of an undistinguished career, and plays with the hard-nosed hustle that Coaches and Miami coke-rap kingpins celebrate. He’s also shooting 35 percent, second worst on the team. Smush Parker was better. Proving Mitch Kupchak’s deft touch at signing impact players to meager contracts, Ed Davis has been one of this season’s lone bright spots. Signed to a one-year deal, the Lakers need to keep the 25-year old, who with Tarik Black and Julius Randle could potentially form the nucleus of a rugged front court. The Lakers need to take this YouTube clip of Jordan Hill’s 26 point and 12 rebound game against the Chicago Bulls, and e-mail it to every team in the league. He’s averaging 15.8 PGG and 10.3 RBG (per 36 minutes) and has a contract specifically tailored to make him attractive to trade suitors. If the Lakers can’t get a decent asset or two for him before the trading deadline, it’s a total failure. 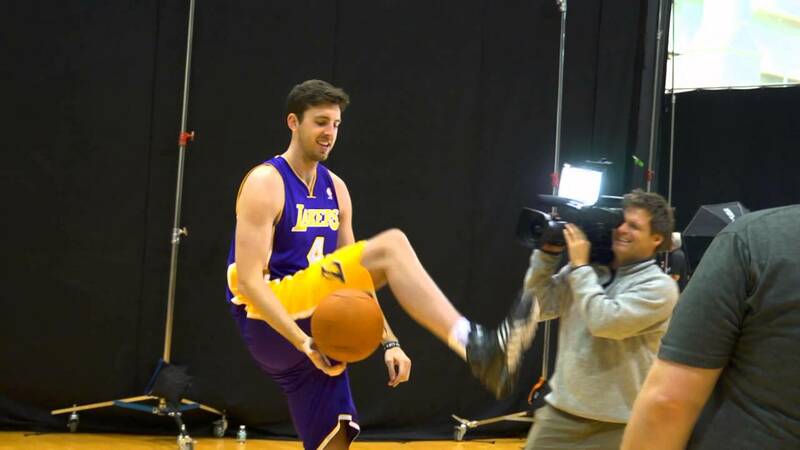 The NBA’s least popular player continues to master the art of the push foul and the rainbow jump shot. Team’s best Uncle Fester impersonator. Bar none. Every now and then, the former high lottery pick will showcase the athleticism that bewitched scouts leading up to the 2010 draft. He’s a quiet likable guy, a hard worker, and plays the best wing defense of anyone on the team. But for him to be a quality NBA player, he needs to hit open jump shots. Teams are basically daring him to shoot. He mostly misses (40.5% FG, 35.8 3P%). Acquired off waivers from Houston, the rookie has shot a torrid 62.5 percent in just 11 games. One of the best parts about being terrible is that you can give playing time to young players who would otherwise never get game experience. He needs to average 25 minutes a game for the rest of the season or else Byron Scott should be forced to carry a stroller into every game.